It was three years after the Model T became the first mass-produced automobile when a salesman from the Iowa Bridge Company met with the City of Chippewa Falls to extol the virtues of a new type of bridge from the Marsh Engineering Company. The attractive rainbow-arched bridge with glass globe lanterns at each of its four corners would be the first of its kind in Wisconsin, the salesman promised, but it was no garish, newfangled contraption that would fall apart after a few years. He assured the small but growing lumber town’s leaders that the bridge was not only strong and durable, but also very popular in Europe. And if cost was a concern, why it just so happened that this type of bridge was quicker to build than traditional construction at the time, and therefore was a real bargain. The City leaders could hardly say no to such a proposition, and in 1916 one of Chippewa Falls’ most iconic bridges was built on Spring Street over Duncan Creek. The salesman’s pitch turned out to be true: The bridge was as sturdy as it was graceful. As decades went by and cars replaced horse-drawn wagons and carriages and more streets and houses rose up on both sides of the creek, it became a beloved landmark for the City, frequently featured on tourism materials and other information about the City. In 1982, it was placed on the National Register of Historic Places, later joined by other structures from the early century like the grand homes of lumber barons and the City’s famous shoe factories. 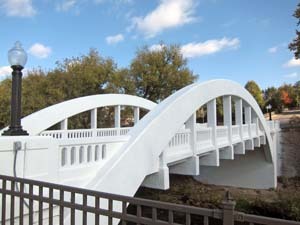 However, by 2009, the bowstring-styled structure – the only remaining Marsh Rainbow bridge in the state - had deteriorated to the point of receiving a functionally deficient classification, and the City faced a difficult choice: replace the bridge with something more modern and functional, which the public was strongly against, or leave the historic bridge as it was but with little functionality. In 2012, Ayres Associates met three times with the City’s residents and came up with a set of solutions that solved the problem neatly, while saving the City money – and which could be applied to similar historic projects. First, with the help of a traffic study, Ayres determined that allowing one-way instead of two-way traffic across the bridge resolved the functional deficiency. Chippewa Falls has many one-way streets anyway, and residents were accustomed to them. The real innovation came with the use of fiber-reinforced polymer wrap. In 2016 – a century after the bridge was built – our structural engineers determined which parts of the bridge could be fixed with typical concrete repairs, and which remaining delicate parts would be wrapped with a fiber-reinforced polymer that strengthens the bridge without compromising the integrity of its iconic arches. The wrap is made of filaments of high-performance fibers like glass, carbon, or Kevlar that are woven into a fabric and then saturated in epoxy. It is strong yet flexible and resists corrosion from salt and ice. While more expensive than traditional concrete, it saved the City money both upfront, by removing the need for a totally new structure, and long-term, by holding up longer through harsh Wisconsin winters. 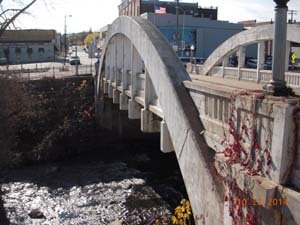 And for the residents and leaders of Chippewa Falls, the restored functionality and safety are matched with the satisfaction of keeping their landmark bridge going strong into the next century. Dave Pantzlaff is the manager of Ayres Associates’ structural engineering group and oversaw the completion of the Spring Street bridge rehabilitation. The Spring Street Bridge Rehabilitation won an Engineering Excellence State Finalist Award in 2018. Ayres Associates is a is a multi-specialty architectural/engineering consulting firm providing services from a network of 13 offices in five states. Our offices are in Wisconsin, Florida, Colorado, Arizona, and Wyoming. 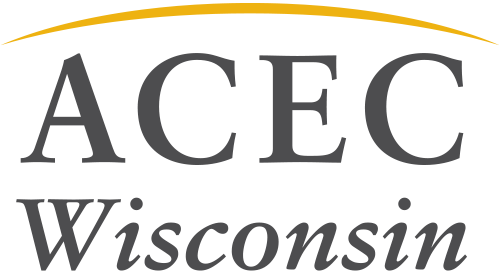 Ayres Associates is a long-time member firm of ACEC Wisconsin.